Money cannot buy me love - but can it buy me innovation? The Second RICH Symposium was held on May 8, 2017 at the Gulbenkian Foundation in Lisbon, Portugal. The objectives of the symposium were to showcase approaches to innovation taken by Research Infrastructures and projects in all scientific domains, as well as to provide a floor for the discussion of policies and incentives for innovation. Octavi Quintana Trias started with an overall introduction to the theme and framed the issue of innovation with the supporting studies by the EC and ESFRI, on Innovation and Long-term Sustainability of Research Infrastructures, as well as the support being provided through H2020 for the promotion of innovation. Philippe Froissard presented the funding opportunities being deployed through the 2018-2020 H2020 Research Infrastructures Work Programme. Sergio Bertolucci as well defined a policy axis on the symposium with the ATTRACT project, playing a more direct role in the acceleration of imaging and detection technologies spinning-off, through cascade granting. Can one actually buy innovation? Even if one can't straight-up buy it, one can deploy multiple types of funding instruments to stimulate it. The symposium showcased HNSciCloud. Bob Jones presented this Pre-Commercial Procurement (PCP) instrument being used to build a Public-Private hybrid cloud for research. Laura Busato talked about instruments from the European Investment Bank (EIB) and support structures, including the InnovFin advisory and reports, such as on funding for Research and Technology Organisations (RTOs). 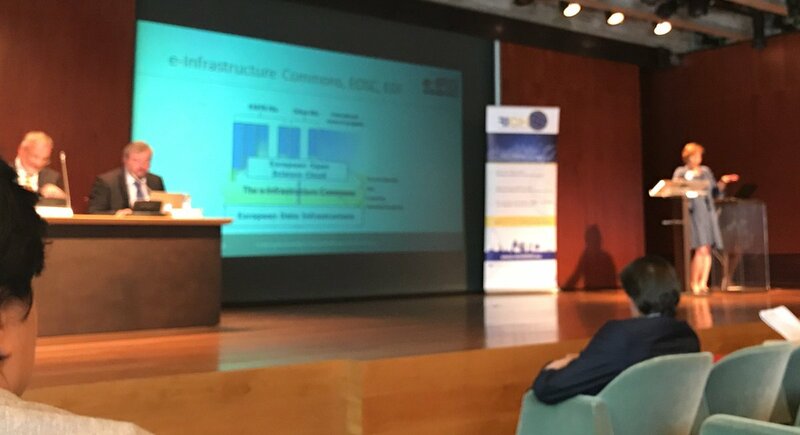 Structural funds investments for the construction of an Extreme Light Infrastructure (ELI) were shown by Roman Hvezda, with a view of Research and Innovation geographic integration in interconnected campuses. The theme of location was of interest to the audience: can you promote pan-EU industry access to Research Infrastructures through the Transnational Access tool, or will the SME users of Research Infrastructures be more or less invariably local? Maybe alternative schemes for SME access should be studied. The thematic clustering of research infrastructure projects was hailed as a successful structure to promote integration and stimulate innovation. Examples came from the Biomedical (Corbel), Environmental (ENVRI-plus) and Social (SERISS) sciences, all of which are deploying innovation-promoting actions. Philippe Froissard promised continued support to clustering through H2020, though the main focus will be on data management. Data management, as noted by e-IRG chair Gabriele von Voigt, is an important condition for innovation. Position papers and their recommendations are of unsung importance for standardization, and e-IRG, together with ESFRI, plays a central role in policy recommendations. If a single point has to be highlighted from this symposium, it has to be the coming-of-age of every scientific domain in the innovation arena. The environmental sciences community seems particularly advanced in this domain, with well-structured and apparently effective strategies being shown by ACTRIS2 and ICOS-ERIC. But this is also true in the medical sciences, through the example of EATRIS-ERIC given by Anton Ussi, with their impressively high numbers on industry use of Research Infrastructures. As has been the case in the past, the social sciences and humanities struggle to find their spot in this arena. Innovation is a desirable outcome of research, and it is one that is very convenient for the community to promote when attracting the attention of national and European funding authorities. But it is just a component that should not be blown out of proportion. As a practical outcome of this symposium, prospective applicants to H2020 Research Infrastructure projects will have a toolbox of strategies to benchmark. The RICH II presentation slides are available at http://www.rich2020.eu/symposium2017.